O.K. guys, heres some homework for ya. Found this one over on Inhabitat. Its an outer shell for a recumbent trike with a plastic bubble top that lights up from the inside. I would love to see this on for sale. Check out the youtube link above. Check this out. The link at the top will connect you to a new blog with a prototype velomobile under development. Looks like a very promising and well put together design. Stay to date on this one. Looks like a winner already. And they already have a plan to reproduce it using vacuum technology. Here is a new product from Blue Sky Designs is a speeder velomobile kit. The price of this kit is 850 dollars with 200 dollars shipping. It is designed to fit over a standard recumbent trike. 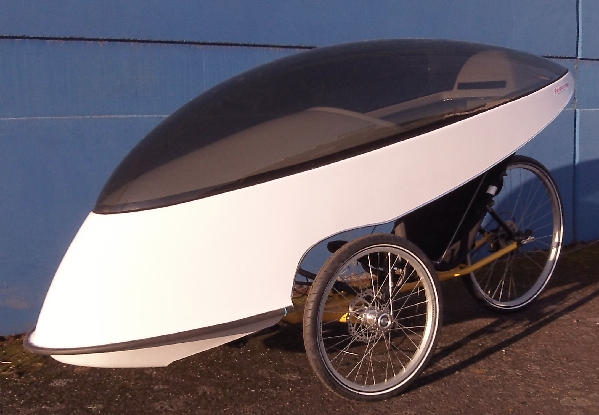 This could be a great shell for a velomobile and you can still choose the trike of your choice. Another benefit is the fact that this velomobile looks as if the shell is easily removable in case you wanted to ride without the shell on. Check out the link above if you would like to have more information.